Michael is a gentle, loving 14-year-old boy of African-American and Caucasian decent. Michael is primarily non-verbal. He expresses his caring emotions by cuddling with staff and family members whom he has a close bond with. Michael, also known as Mikey, is a very social kid. He enjoys his time with the animals during pet therapy. When weather permits, Mikey enjoys swimming. Although Mikey is nonverbal he is able to communicate when he is feeling frustrated or upset. 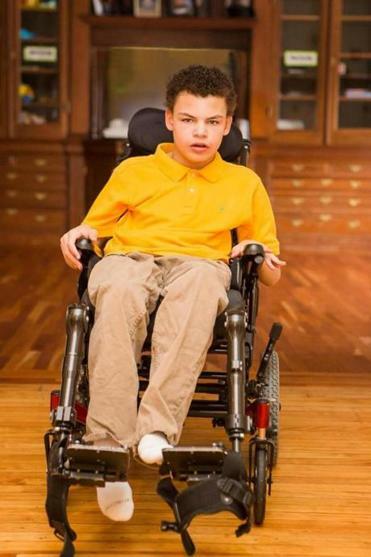 Mikey is engaging and enjoys spending time with his peers and staff at school. He does well with the extra support he receives in school. Mikey enjoys being read to. Not yet legally freed for adoption. The ideal family would be with a family who can be nurturing, patient, and understands Mikey’s medical needs and is able to provide a safe and stable home. Can you provide the guidance, love, and stability that a child needs? If you’re at least 18 years old, have a stable source of income, and room in your heart, you may be a perfect match to adopt a waiting child. Adoptive parents can be single, married, or partnered; experienced or not; renters or homeowners; LGBTQ singles and couples.